Sort and wash beans; place in a large Dutch oven. Cover with water to 2 inches above beans; bring to a boil. Cook 2 minutes; remove from heat. Cover and let stand 1 hour. Drain beans; return to pan. Add 4 cups water and 1 teaspoon salt; bring to a boil. Reduce heat, and simmer 1 hour. Drain and set aside. Wipe pan dry with paper towel. Heat pan over medium-high heat. Coat pan with cooking spray. Add onion to pan; sauté 5 minutes or until tender. Add garlic to pan; sauté 30 seconds. 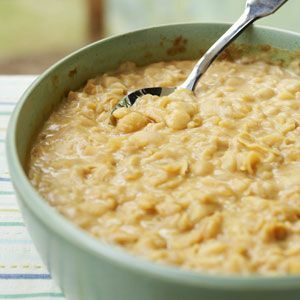 Combine beans, remaining 1/2 teaspoon salt, onion mixture, broth, and next 4 ingredients (through mustard) in a 13 x 9-inch baking dish coated with cooking spray. Bake at 350° for 1 hour. Remove from oven; stir in sour cream. Serve immediately.